This Burmese Curry is a very basic pork curry. Like many other dishes in Myanmar this meal is very simple and you don´t need much ingredients to cook it. Meat is very expensive for common people and you can´t find this delicious dish in every region in Myanmar. This recipes showes you one more time how simple it is to create a delecious meal without many ingredients. 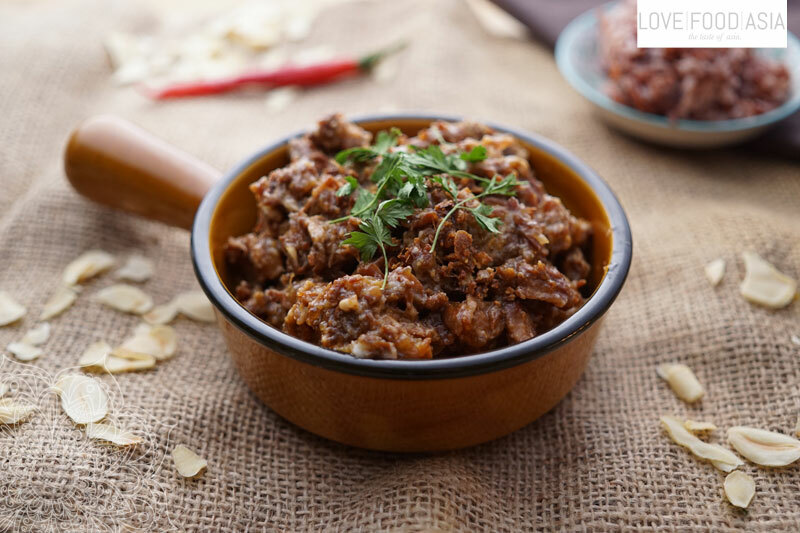 The Burmese Red Gold Pork Curry is one of our all time favorite recipes in Asia.We recommend you to cook this curry in a pressure cooker! You´ll save a lot of time! Dice pork in 3-4 cm cubes and rub hard with thick soy sauce and pepper. Scrape ginger, cut 2 cm thin slices, then stripes. Chop and mash the rest. Soak garlic chips in 2 tsp water and mash. Mix 80 ml water with chili powder. Heat oil in a pressure cooker. Add ginger stripes on high heat and stir fry for 1 minute. Add pork dice and stir fry for 3–5 minutes. Extract juice of mashed garlic and ginger with 120 ml water. Pour mixture into pan. Cover pressure cooker and simmer on low heat for 25 minutes. Keep ginger and garlic solids. When water is absorbed, add thin soy sauce and chili water. Simmer till tender. Add onion rings, cover and cook till rings are clear, all water is absorbed and pork is well browned. Taste with salt. Drain pork and onions and arrange in a serving dish. Reheat oil and fry garlic and ginger solids till crispy. Drain and put on to the pork and serve Burmese Curry with rice and hot oil on top. The perfect combination: Burmese Red Gold Pork Curry and Burmese Cucumber Salad!